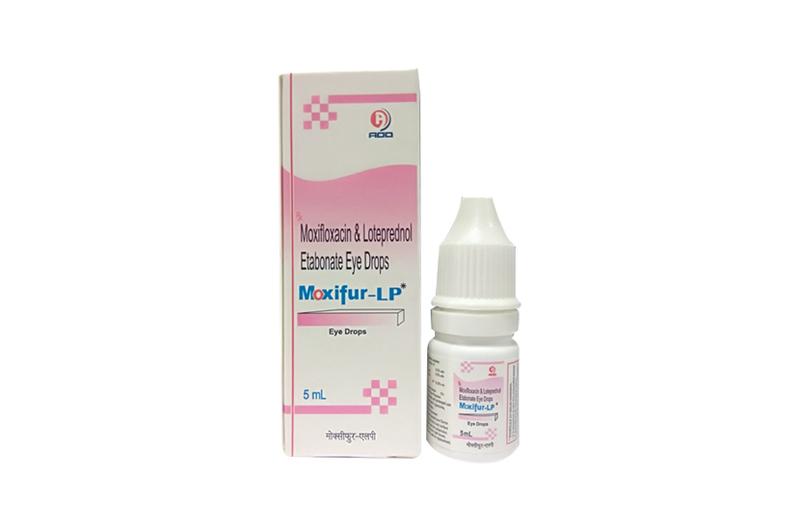 Moxifur-LP Eye Drops contains Loteprednol Etabonate 0.5% and Moxifloxacin 0.5%. Loteprednol etabonate (LE) is a soft steroid used for the treatment of steroid responsive inflammatory conditions of the eye such as allergic conjunctivitis, uveitis, iritis, cyclitis, and selected infective conjunctivitis. Loteprednol etabonate has good ocular permeation properties. Moxifloxacin is a quinolone/fluoroquinolone antibiotic. It is a broad-spectrum antibiotic that is active against both Gram-positive and Gram-negative bacteria. Loteprednol etabonate is glucocorticosteroids, that act by the induction of phospholipase A2 inhibitory proteins, collectively called lipocortins. These proteins control the biosynthesis of potent mediators of inflammation such as prostaglandins and leukotrienes by inhibiting the release of their common precursor arachidonic acid (Arachidonic acid is released from membrane phospholipids by phospholipase A2). Moxifloxacin has bactericidal action that results from inhibition of the enzymes topoisomerase II DNA gyrase (which is essential enzyme involve in replication , transcription , repair bacterial DNA) and topoisomerase IV (is an enzyme known to play a key role in the partitioning of the chromosomal DNA during bacterial cell division). 1.Seasonal allergic Conjuctivities with secondary infections. Moxifur-LP Eye Drops, as with other steroid anti-infective ophthalmic combination drugs, is contraindicated in most viral diseases of the cornea and conjunctiva including epithelial herpes simplex keratitis (dendritic keratitis), vaccinia, and varicella, and also in mycobacterial infection of the eye and fungal diseases of ocular structures. Moxifur-LP Eye Drops is also contraindicated in individuals with known or suspected hypersensitivity to any of the ingredients of this preparation and to other corticosteroids. Prolonged use of corticosteroids may result in glaucoma with damage to the optic nerve, defects in visual acuity and fields of vision, and in posterior subcapsular cataract formation. Steroids should be used with caution in the presence of glaucoma. Sensitivity to topically applied aminoglycosides may occur in some patients. If sensitivity reaction does occur, discontinue use. One drop of Moxifur-LP Eye Drops into the conjunctival sac of the affected eye(s) every 6-8 hours or as directed by Physician. Moxifur-LP Eye Drops is supplied in one Opeque Polethylene Bottle packed with printed labelled & cartons And Such 25 Carton Packed in a Shrink Sleeves & corrugated box.